A group of Longmeadow, MA residents rallied citizens to successfully defeat three proposals for increased gun control aimed at adding restrictions on both gun owners and businesses. While all three measures were rejected by a majority vote, Henry Lanouette, Communications Director for Longmeadow Citizens for Liberty, says citizens across America can have the same effect in their community. Lanouette and Walt Lamon founded the group which grew to a committee of about 31 and now has a membership of about 125. The group worked tirelessly in the weeks leading up to the vote, talking to local media, reaching out to friends and neighbors, putting up yard signs, even handing out informational pamphlets before Tuesday’s town hall and vote. Residents first voted to reject Article 29, which was a bylaw that would impose fines for anyone who carried a firearm on town property. 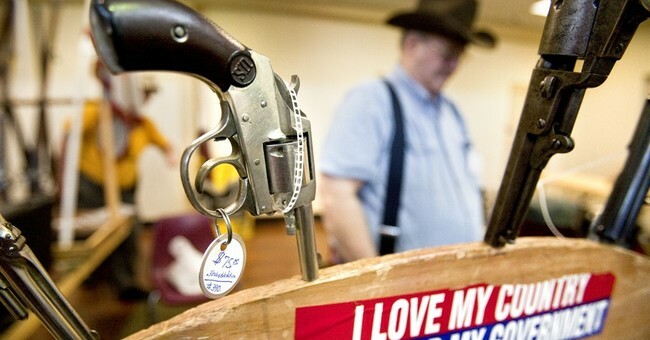 They also voted to reject Article 30, a bylaw that would have forced gun owners to describe, in writing, each gun they own when they renew their gun license or apply for an FID card. The other proposed article rejected, Article 31, was meant to ban assault rifles in town, and would have imposed a $300 fine for each day the gun is in town. Some feared the bylaws took away their Second Amendment rights, while others thought the proposals would improve public safety. While some immediately spoke out against the vote, leave it to an elite member of academia to attack a group of citizens holding the American flag and speaking out against unconstitutional laws. A poli-sci professor from Connecticut took to a MASS Public TV blog in response to their efforts by calling the group “jingoistic patriots”. Are you paying attention, America? You can rally your community into action, too. Use this example from LongForLiberty to inspire a 2A grassroots to take hold in your area and let’s show our elected officials just what the power of we the people can truly accomplish!